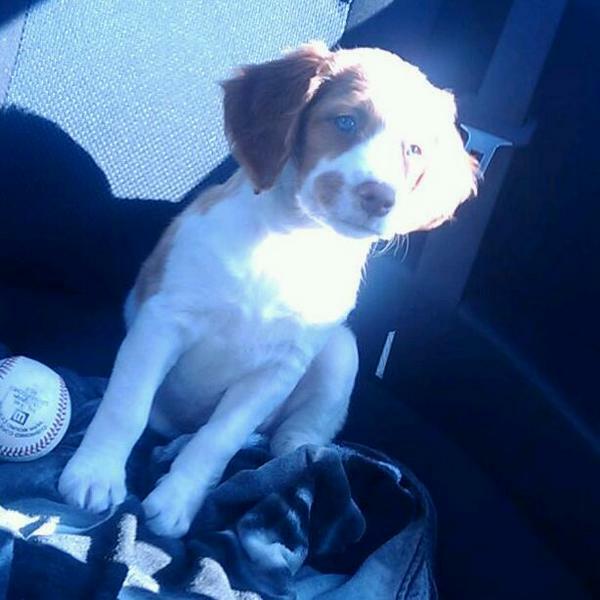 The Brittany, formerly known as Brittany Spaniel, is an athletic and sturdily built dog of medium size. Their ears are short and triangular, lying flat against the skull, which is rounded and medium length. The Brittany’s face is intelligent and expressive, and their eyes are various shades of amber or hazel. The dog’s frame is strong and leggy, with their height at their shoulders equal to their length. The tail is naturally short but is generally docked to a length of about four inches. The coat is dense and either flat or wavy with some feathering on the ears and legs. The dog’s coloring is typically orange and white or liver and white in clear or roan patterns, with some dogs having a tricolor pattern. 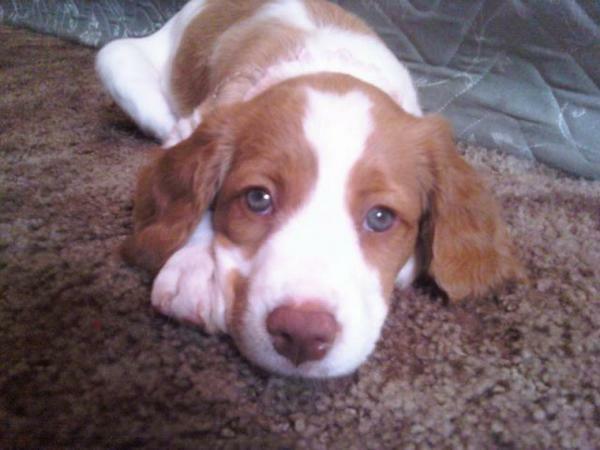 Freckles on a Brittany are also common! 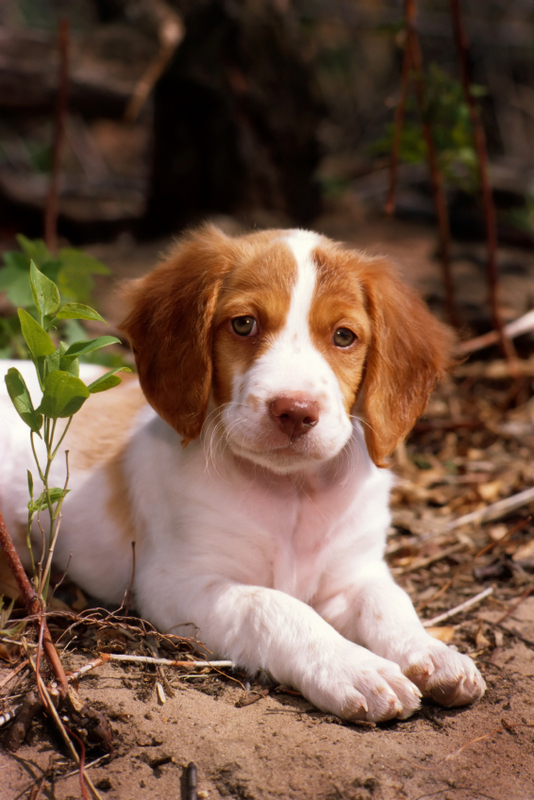 This breed is still commonly referred to as the Brittany Spaniel, despite the AKC's official removal of "Spaniel" from the breed name in 1982 (read more about this in the history section). Height (Male) 17.5 - 20.5"
Brittanys have good nature and natural eagerness to please, making them a great companion pet, but potential owners should be aware that the breed requires plenty of exercise. 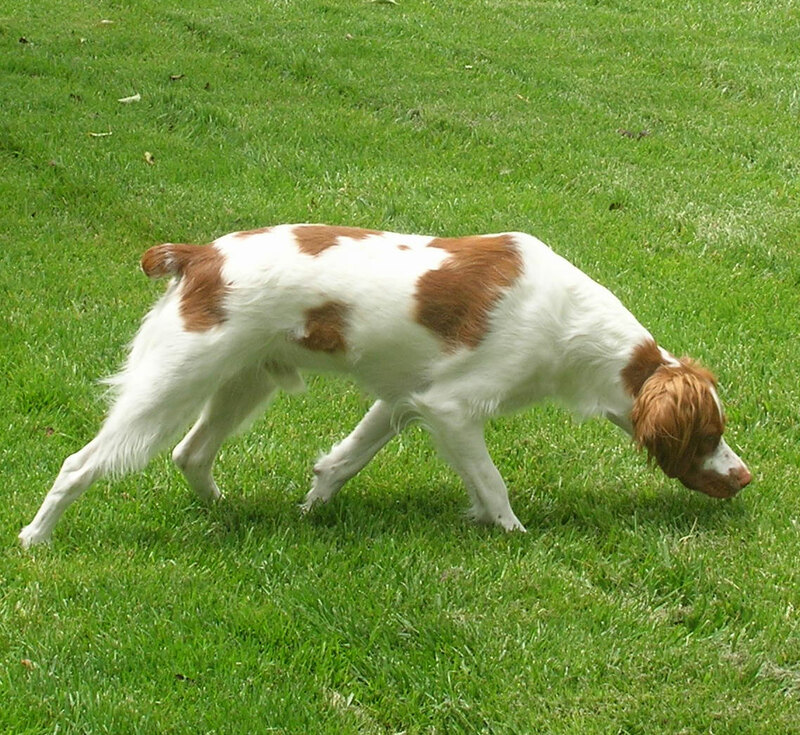 Let your Brittany roam in open areas whenever you can, especially with other dogs. 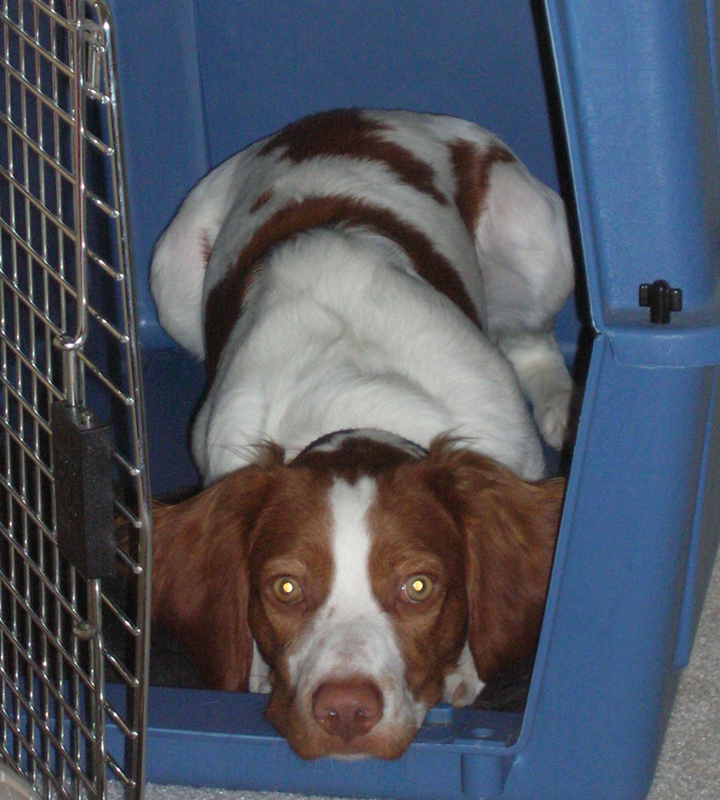 The Brittany is highly trainable and obedient, but is also very sensitive to reprimand; take care not to chastise your Brittany too roughly, or it may become shy and fearful. The dog is a natural socializer and gets along exceedingly well with other dogs and children, though small children should never be left alone with a Brittany as the dogs natural energetic play could cause the child accidental harm. 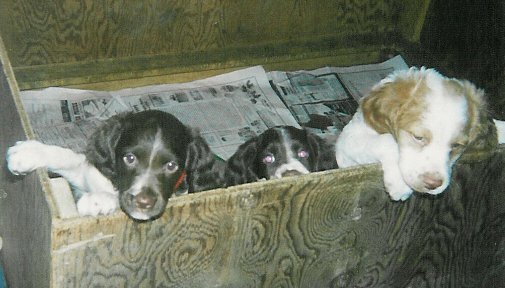 The Brittany Spaniels athleticism and friendliness make it equally attractive as a hunting buddy or a lifelong companion. Health problems are rare, though the breed is susceptible to hip dysplasia, epilepsy, and ear infections; owners should take special care to inspect the dogs ears after playing outdoors. Their coat only requires occasional brushing and shampooing, and shedding is generally light to moderate. 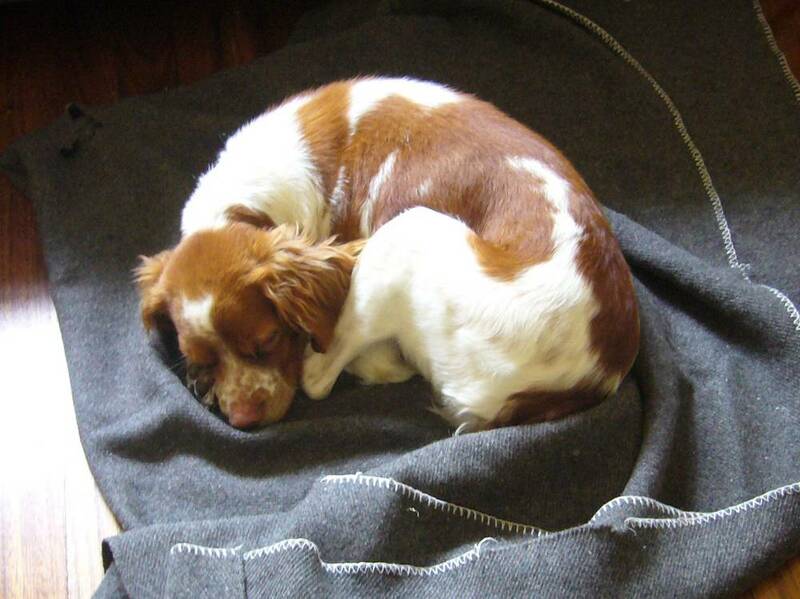 A Brittany dog requires a great deal of exercise and plenty of room to move around. This breed is not a good fit with a sedentary or apartment lifestyle. While there is no consensus on the origins of the breed, many experts believe the dog is a product of interbreeding between English Pointers and spaniels native to the Brittany province. The strong historical ties between Brittany and southern Britain lend strong support to this theory, as frequent interaction between merchants, politicians, and hunters could easily have resulted in pairings between English and French hunting dogs. 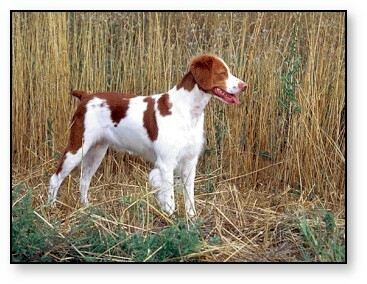 Depictions of dogs bearing a strong resemblance to the Brittany Spaniel can be found in paintings and tapestries dating back to the 17th century, in which one sees the dog being used to locate and capture game, much as it is used today.The Brittany as we would recognize it today, however, traces its origins back to the mid-19th century. 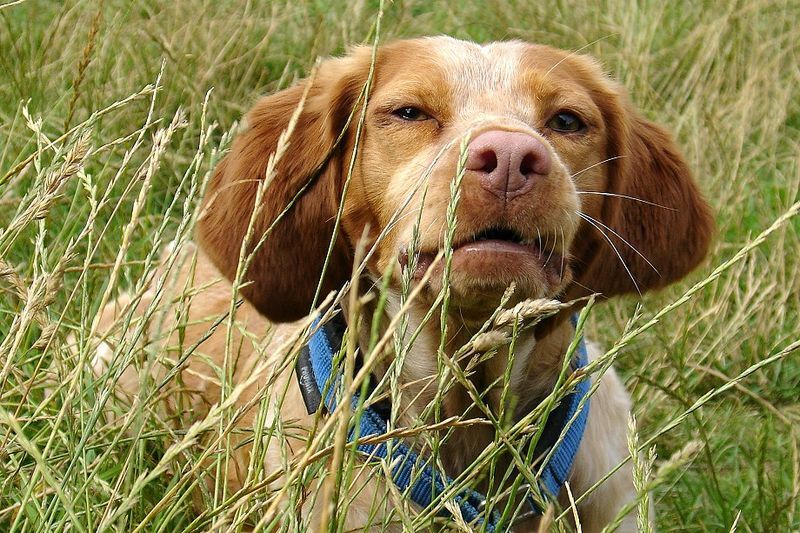 The first written account of a Brittany (or a dog very much resembling one) dates back to 1850, when an English clergyman by the name of Reverend Davies wrote about hunting with small, bobtailed dogs that pointed, retrieved, and worked well in the brush. Around this time, it is said that a local hunter in the small French town of Pontou bred his white-and-mahogany dog with a yellow-and-white dog owned by an English sportsman who was in Brittany on a hunting trip; the resulting litter produced two tailless puppies, arguably the first of the Brittany breed. 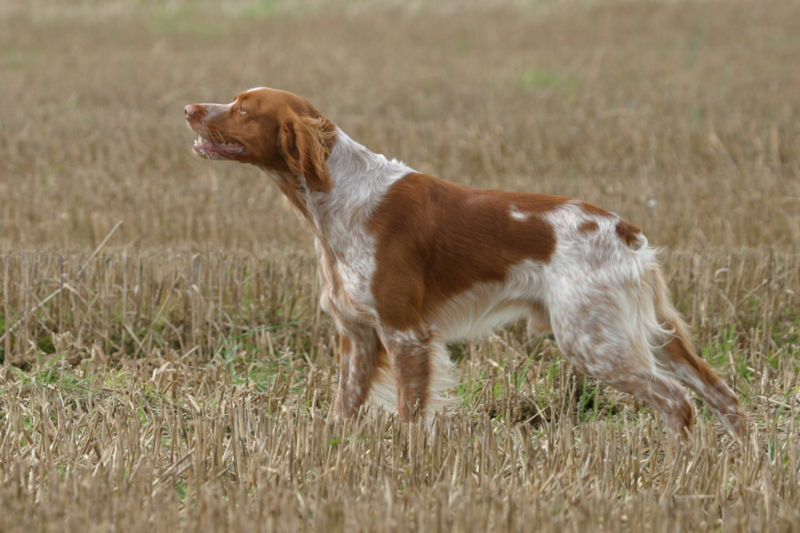 The Brittany was first officially recognized in France in 1907 and was registered with the name Boy, an orange-and-white, as the first pagneul Breton queue courte naturelle (Brittany Spaniel with short natural tail). 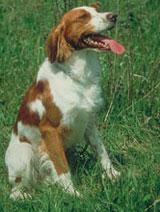 The Brittany was brought to the United States in 1931 and recognized by the American Kennel Club in 1934. 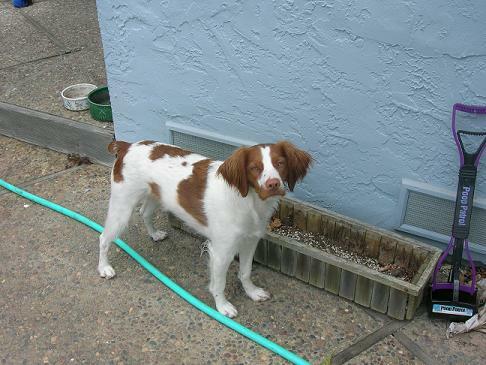 In 1982, the AKC dropped Spaniel from the breeds name in recognition of the dogs pointer/setter-like characteristics, though the breed is still called Brittany Spaniel in other countries. To this day, the Brittanys agility, obedience, and strong nose make it a perennial favorite among hunters and dog fanciers alike.